When you choose a pump to go at the bottom of a well, the calculation of which pump is best suited to your specific requirements is exactly the same as for surface pumps. The only difference is the suction depth is zero (the pump is immersed). The maximum attainable suction height of any pump is 10.33 m. This is an absolute value at the limit of physical possibilities. To guarantee maximum output from your pump, Tecnoma recommends limiting the height below the pump to somewhere between 7 m and 9 m, depending on the model. 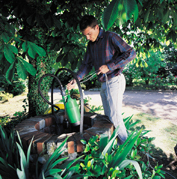 If you need to pump from a greater depth, use a well pump.